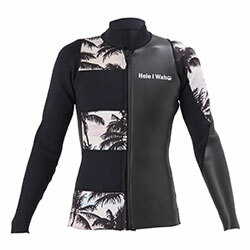 The 3mm neoprene will prevent getting cold and even adds a bit of buoyancy. Can also be used under a full suit as an inner layer, and fits snugly around the shoulders when layered with other garments. Smooth skin piping around the neck and shoulders increases adhesion to the skin and minimizes water ingress and egress.